Welcome to the Chinese National Day Reception. We are delighted to have you with us for the 69th anniversary of the founding of the People's Republic of China. 69 years ago, on Oct. 1st 1949, the People's Republic was founded. The Chinese people, having gone through more than 100 years of hard struggle, finally witnessed the rebirth of their nation and embarked on a glorious journey for dignity, prosperity and strength. The year 2018 also marks the 40th anniversary of China's Reform and Opening up - an endeavor that transformed China and the world. Over the past 40 years, China's GDP and foreign trade have been growing at an average rate of 9.5% and 14.5% annually. The per capita disposable income increased over 100 times. More than 700 million Chinese people were lifted out of poverty, accounting for over 70 percent of the world's poverty population. Over the past 40 years, China has been an active participant of the economic globalization and a contributor to the common development of the world. As the second largest economy, the largest industrial producer and the largest trader of goods, China contributed over 30% of the global economic growth over the recent years. As an international public product that China provides for the world, the Belt and Road Initiative is aiming to exploit new cooperation space, tap into new cooperation potential and achieve shared prosperity among all the countries. In the past five years, the total volume of trade between China and the countries along the route has exceeded 5 trillion USD, the outward foreign direct investment from China has exceeded 70 billion USD, Chinese enterprises have built 75 economic and trade cooperation zones,creating 2.2 billion USD taxes revenue and 210 thousand jobs for host countries. What we have achieved over the past 40 years has only cemented our resolve to advance the Reform and Opening up. At the Boao Forum for Asia Annual Conference 2018, President Xi Jinping announced a number of initiatives to open China further. These initiatives are being steadily implemented. China is building a more investment-friendly environment that is aligned with international standards. We encourage competition, oppose monopoly, and are strengthening the protection of intellectual property rights in accordance with the law. China is improving its trade structure. China does not seek trade surplus. As a major step to expand its import and further open its market to the world, China will hold the first China International Import Expo in Shanghai this November. Around 140 countries and regions, including Israel, and about 3,000 companies have confirmed their participation and over 150 thousand professional buyers in and outside China are expected to attend the Expo. China is upholding the open and free trade regime. We are working closely with like-minded countries and organizations to promote trade liberalization and investment facilitation, improve the multilateral trading system and make economic globalization more open, inclusive and balanced. China's Reform and Opening up has also given a strong boost to China-Israel cooperation. Our cooperation in economy, trade, technology, agriculture, education, health-care, culture and academia are strong and vibrant. The high-level exchanges are giving guidance to our bilateral relations. Last year, Prime Minister Netanyahu paid a successful visit to China. During the visit, the leaders of our two countries announced the establishment of the China-Israel Innovative Comprehensive Partnership, elevating the bilateral relations to a new level, and charted the course for our future cooperation. The intergovernmental cooperation mechanisms are providing strong institutional guarantees of our relations. We have set up a Joint Committee on Innovation Cooperation and an Intergovernmental Mechanism of Economic and Technological Cooperation, which provides sound platforms for coordinating our cooperation in various fields. The win-win economic and trade cooperation is flourishing. In 1992, the bilateral trade volume was only 50 million USD. While in 2017, it surged to over 13 billion USD, registering an increase of over 260 times. China is now Israel's largest trading partner in Asia and the third largest across the world. In the first half of 2018, our trade volume grew by 21.6% and China's import from Israel has increased by 47.2%, showing signs of big potentials lying in the trade between our two countries. The People-to-people and cultural exchanges are booming. Currently, there are 4 direct flights between China and Israel, connecting Beijing, Shanghai, Guangzhou and Hong Kong with Tel Aviv. The next direct flight between Chengdu and Tel Aviv will be launched later this month. 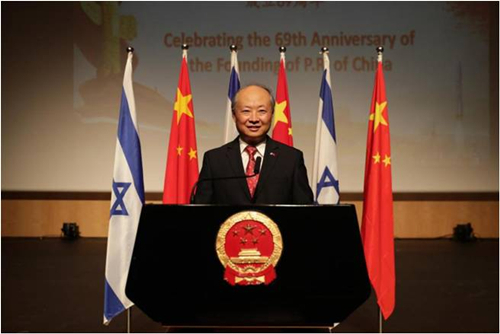 An aviation network between China and Israel has taken shape. In 2017, the number of Chinese people visiting Israel reached 139 thousand, almost three times as many as in 2015. The number of visitors from Israel to China has also increased to 52 thousand, demonstrating an equally strong momentum. Last November, the Chinese Culture Center opened in Tel Aviv, establishing another channel for Israeli people to understand more about China through its culture. Looking into the future, I have every confidence that China and Israel will embrace more opportunities for cooperation. The China-Israel relations would not have come this far without the support and contribution of our friends and colleagues in Israel. I would like to take this opportunity to express my appreciation for your continued interest in and support for China's progress and China-Israel relations. We look forward to working hand in hand with our friends in Israel to create a better future for both countries and peoples.